I recently came across Horizon Fuel Cells http://www.horizonfuelcell.com/ who were demonstrating educational kits at the BETT Show in London. I have followed fuel cell developments for some time and so it was great to see affordable kits that can be used to show how hydrogen can be produced, stored safely in metal hydride canisters and subsequently used to create electricity. These canisters appeared briefly on the market some years ago, but vanished again before I could obtain any. So have I purchased a great little car and a more sophisticated kit complete with a wind turbine and photvoltaic cells to produce environmentally friendly hydrogen. The wind turbine in particular is well designed, with several different blade profiles and a variable angle of attack for experiments on efficiency. I will use these kits to generate interest for our STEM (Science, Technology, Engineering and Maths) projects and also for more able and talented. And what is even more fun is the RC car – check out the video on the website! 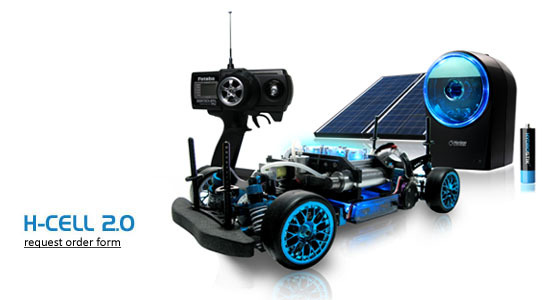 This uses two hydride canisters and a 30W fuel cell to boost a model RC car. The hydride canisters will be able to be refilled from a ‘Hydrofill’ unit which I believe will be the first hydrogen generator designed for domestic use. I wait eagerly to see this come into production. So why not start to plan for fuel cell projects in our schools? We should be giving young people the opportunity to experiment with and build bikes, go-carts and whatever else (model planes?) using this exciting and suddenly accessible technology.